Amazon: The Sweet Potato Queens® are back and bawdier than ever in Southern belle extraordinaire Jill Conner Browne’s ninth edition of the hysterical series. Having experienced pretty much ALL of the crappy parts of life, Browne feels it is her duty to render whatever assistance she can to her fellow sufferers — and she does so in her own inimitable fashion. Kritters Thoughts: Quite a comedic book that made for a great break from the novels that I had been reading. With a theme throughout this book as to how to get through painful times, each chapter was different and unique. I enjoyed reading a chapter on its own and being able to easily put down and pick the book up again. I am not sure that my age group is the exact audience, but I think we younger gals can enjoy and appreciate the humor in this book. I think this a book for our mothers to enjoy. I would also think this book would be a better read for those in the Southern half of the United States or who wish to return to the South! 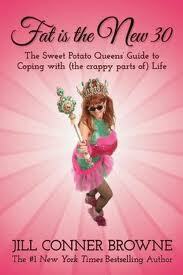 Although this was my first experience with The Sweet Potato Queens, I would definitely read another in the future. Unfortunately in this book there were some inside jokes that I didn't quite get, so I would definitely start back at the beginning and enjoy the series in order. I'm in the middle of reading this one right now actually!